Remarketing is the latest, highly effective online advertising solution which is reaping significant results. It keeps track of your visitors on your site by placing a small piece of code on your site and then cookies follow you around the internet and keep showing you the products or services your were browsing earlier. The ads with these products and services are considered highly targeted and keep showing up on different sites you are on in order to persuade you to take some action. It can be quite unnerving the first time you see remarketing in action and some people may find it invasive and possibly frustrating to keep seeing the same ads following them around the internet, Avinash Kaushik, Analytics Champion and Author, has written a very good article explaining the concept and how many advertisers are not creating impactful creative ads. When you look at your Google Analytics report and see that 2% of your visitors are converting to leads or sales you then have to figure out what it is that’s making the other 98% disappear and, of course, quickly figure out how to get them back. If someone has been on your site and shown interest in your products or services, there could be many reasons they have not converted into a lead or a sale. 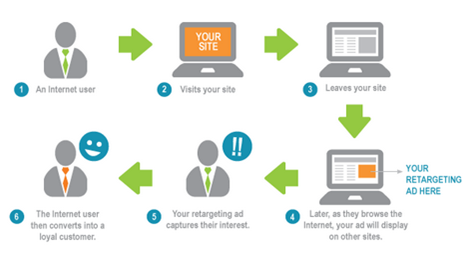 With retargeting you have the chance to deliver your message to these visitors again. Once your site visitors leave your website without converting, your ads will follow them to the next sites where they will be display to them again.. In this way your brand gets more exposure and gains momentum and traction. Most media agencies average between 17 and 20 ad per month per user and currently, this seems to be the optimum cap to avoid over exposure. Meanwhile, it does have to be said that different brands have different affects so it’s wise to track campaigns closely. So far, the statistics speak for themselves with significantly higher conversion and brand recall rates. Remember that whilst click through rates with retargeting will be low, the conversions will be higher.